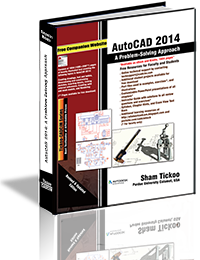 In this post, I will review the book AutoCAD 2014 A Problem Solving Approach and provide a feed back on the pro’s and con’s to help you purchase the book or not. The book AutoCAD 2014 A Problem Solving Approach – is written by Prof Sham Tickoo, from Purdue University and from CADCIM Technologies. This book A Problem Solving Approach has been a continuing series since AutoCAD R 14 and has been well written. Let’s review in detail. Disclaimer – Before I proceed with the review and rating of the book – I did not receive the book for free to write a review, but instead I purchased a copy and sharing my review as a blogger that can help millions of users to learn and benefit from purchasing this book. The books table of content is well structured right from introduction to advanced topics within AutoCAD 2014. So for a beginner I personally feel can easily able to understand and put to action after learning from the book. The book images / figures a are well illustrated and better explained. However, using arrows could have been better made, by using Snagit Software. But overall I would suggest that figures could have been better captured and presented in a simple manner. ” Especially the introduction chapter image on different parts of AutoCAD Software needs improvement in the next release. But over all Rating of 3.5 / 5 for the Illustration. This is the only book in town which features a download link to teaching resources where you can get ppt content to directly teach in the class get solutions to chapter exercises and much more. So one book helps you teach AutoCAD both at class and at lab. I would suggest the pricing is the best for the exhaustive content provided. Its worth the pricing. This book contains information on various certification related content that can help you pass the AutoCAD 2014 Certified User Exam and gain better competitive position when applying for a job related to AutoCAD. Consists of 36 pedagogical sequenced chapters covering the application part of AutoCAD. Additional information is provided throughout the textbook in the form of tips and notes. Self-Evaluation test and Review Questions are provided at the end of each chapter so that the users can assess their knowledge. Step-by-step instructions promote efficient use of the software while strengthening the problem-solving skills. Usage of commands and shortcuts to increase efficiency of the users. Dual emphasis on conceptual learning and hands-on practice leads to a thorough understanding of AutoCAD 2014. Latest enhancements in software like Inventor Fusion, Drawing Views, and In-canvas Viewport Controls etc. have been added. Overall I would rate this book a 4.5 / 5 for the cost and content made available in the book. In case you are interested in purchasing the Book use the link below to purchase.